Mirah Belle introduces unadulterated, pure essential oils that improve the health of your skin, hair and body. These 100% Pure Essential Oils offer a variety of benefits from cosmetic, dietary purposes and are known for their healing effects mentally, physically and emotionally. Mirah Belle's Lemon Essential Oil has amazing health benefits and carries clarifying and rejuvenating properties. It is suitable to be used on skin and hair. Lemon essential oil for the hair: For those of you with an oily scalp, the lemon essential oil is ideal to use as it is a drying and clarifying oil. The oil also contains antiseptic and antimicrobial properties. 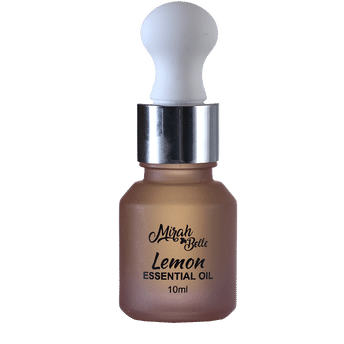 Lemon essential oil for the skin: The lemon essential oil is an excellent method of rejuvenating and gently cleansing the skin. This oil is one of the most powerful anti-acne essential oils. The presence of antioxidants, Vitamin C and citric acid help to fight off the acne causing bacteria and also boost the collagen production.